The settings for the graphic display* and acoustic signals are controlled via the sound system or MMI*. – Select: Function selector button CAR > Audi parking system. • off - The parking aid gives only acoustic warning signals when it is activated. • Graphic - The graphic display appears when reversing and driving forwards. • Rear View* - The picture from the reversing camera is shown when reversing and driving forwards. • Automatic* - The picture from the reversing camera is shown when reversing and the graphic display is shown when driving forwards. You will hear a short test tone each time you make a new setting. 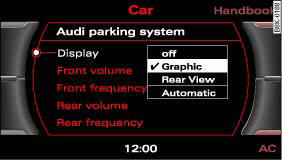 • You can also change the warning beep settings directly from the graphic display* or reversing camera* picture. Simply press the control button for SEttings*. • New settings are not activated until you switch on the parking aid again. • The settings will be automatically stored and assigned to the remote control key.